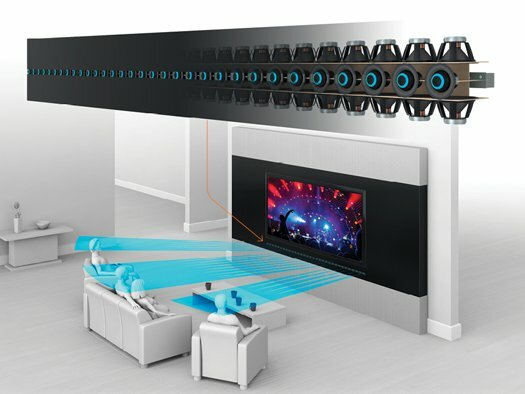 While sitting in a theater or in front of a home theater system we all have wished to get the best seat to get the best view and the surround sound effect. In the case of a speaker or any audio system there exists a spot called the sweet spot, where the effect of surround sound is at its best. We can feel a slight change in its features even if we are sitting a little away from the spot. Â Most f the technologies available today have been able to produce only one sweet spot to get the best sound. What if a speaker system can produce more than one sweet spot? Here we are talking about such a technology; THX have designed a speaker, â€œthe steerable line arrayâ€ which can produce up to 8 hotspots.Â More number of hotspots means more clarity in audio; thereby helping more people to enjoy the super clear audio with ease. This new speaker can be used in home theaters and other audio systems. Now let us take a look of the various parts of this technology in detail. Housing – The array is fit inside a 6 foot long cabinet and 1.4 inch tall.Â This array will force sound waves to travel through a narrow slot channel and hence produces a highly directional strong sound wave. Amplifiers – A new kind of amplifier manufactured by THX is used in technology. Each driver is accompanied with a 100 watt driver which is powered up only when the driver needs it and when it is inactive, it consumes less than a watt. For this reason bulky heat sinks are not necessary in this speaker. Speakers â€“ 92 speaker drivers are used to deliver the high quality sound. For firing sound 30 low and mid drivers are used and 32 drivers are used in the case of high frequencies. Processor- A duel core processor is employed to process the sound waves. The process is responsible for producing more number of hotspots.Â According to pre-defined hot spots the processor will decide when the drivers will fire. User Interface – The user can use the pre-installed apps in a smart-phone or a computer to mark the sweet spots. Once the seats are targeted as sweet spots there is not much to do other than to sit and enjoy the crystal clear sound. In near future THX is getting ready to deploy infrared sensors so that the array could recognize people automatically. There is no doubt that it is one of the main turning points in the field of sound engineering. will want to learn more….